Take a moment to read the full article here. 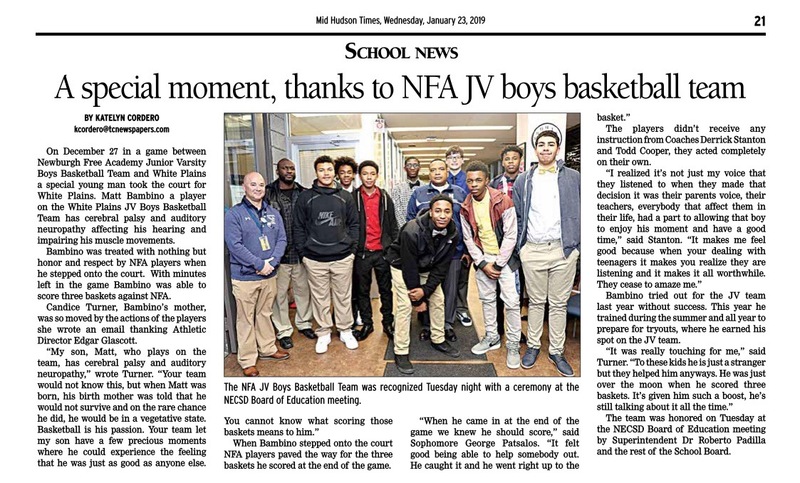 On December 27 in a game between Newburgh Free Academy Junior Varsity Boys Basketball Team and White Plains a special young man took the court for White Plains. Matt Bambino a player on the White Plains JV Boys Basketball Team has cerebral palsy and auditory neuropathy affecting his hearing and impairing his muscle movements. Bambino was treated with nothing but honor and respect by NFA players when he stepped onto the court. With minutes left in the game Bambino was able to score three baskets against NFA. Candice Turner, Bambino’s mother, was so moved by the actions of the players she wrote an email thanking Athletic Director Edgar Glascott. When Bambino stepped onto the court NFA players paved the way for the three baskets he scored at the end of the game. The players didn’t receive any instruction from Coaches Derrick Stanton and Todd Cooper, they acted completely on their own. Bambino tried out for the JV team last year without success. This year he trained during the summer and all year to prepare for tryouts, where he earned his spot on the JV team. The team was honored on Tuesday at the NECSD Board of Education meeting by Superintendent Dr Roberto Padilla and the rest of the School Board.